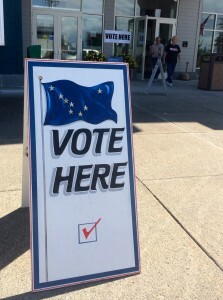 Five Wrangell residents have filled to run for office in October’s municipal election. That’s as of midday Monday. Potential candidates have until 5 p.m. Thursday, Aug. 31, to fill out forms and deliver them to the municipal clerk. Borough Clerk Kim Lane said eight seats are on the ballot. Assembly member Stephen Prysunka filed for re-election. Two assembly seats are up for grabs. Jessica Rooney filed to run for a full, three-year school board term. Robert Rang, who was appointed to fill an open board seat, filed to complete that term, which lasts for two more years. The third seat on the ballot is for a full, three-years term. Mark Mitchell has filed to run for port commission. Jennifer Bates for hospital board. But no one has filed for the remaining two open hospital board positions. Mitchell, an assembly member, is not running for that seat. Lane said it’s easy to become a candidate. “They would need to come into my office and pick up a packet for declaration of candidacy. It’s just a two-page form that they would have to fill out and get at least 10 qualified voter signatures in order for them to be listed on the ballot,” she said. Lane said candidates have to be registered to vote in Wrangell. Three other residents have picked up candidate packets. Lane said it’s not unusual for people to wait until the last minute to file. Note: This report was updated Aug. 28 to reflect an additional filing.